Summer's a time for sales, and a tiller is a big investment. Here's what you need to know before buying. For any garden too big to manually loosen the soil with a digging fork – which, unless you relish hours and hours of back-breaking work, means any garden consisting of more than a couple four-by-eight-foot beds – a tiller is an essential tool for creating the loose, fluffy soil that annual vegetables thrive in. But the variety of options can be daunting. Before you head to your local equipment dealer, familiarize yourself with the basics so you’re not sold something that you don’t need. Confused by all the tiller jargon? Here are the basics. Cultivator: These mini-tillers are narrow enough to pass between rows of vegetables to “cultivate” the weeds that emerge after a crop is planted – meaning dig them out – without disturbing the roots of the crop. Besides removing weeds, cultivators are good at loosening the surface of the soil and mixing in compost in preparation for planting. They are not the tool, however, for tilling up hard earth that has never been tilled before. Front-Tine Tiller: These light-duty tillers, in which the tines (the blades that churn up the earth) are at the front of the machine, are larger and more powerful than cultivators. They are an affordable, all-purpose option for medium-sized gardens. The turning tines help to propel the machine forward, but it takes a fair amount of upper body strength to operate them, and they are tiring to use for long periods or in soil that is hard, rocky, or full of roots. Rear-Tine Tiller: These heavy-duty tillers have blades at the back and wheels at the front. More importantly, the wheels are typically powered by the engine, so they are easier to operate for long periods compared to front-tine tillers. On the other hand, the machines themselves are much heavier and larger, so it still takes plenty of strength to maneuver them. These tillers are the best option for breaking ground in heavy clay soil that has never been tilled before, or where the soil is full of roots and rocks. High-end rear-tine tillers, while pricey, are still cheaper than a tractor, so they are often employed by small sale market gardeners whose plot (and income) are not big enough to justify a larger investment. 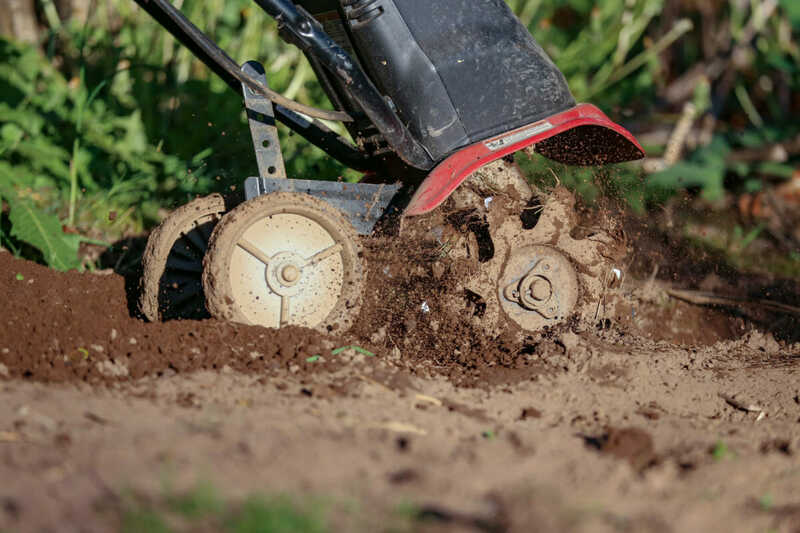 Gardeners with small plots often rent a rear-tine tiller to work the ground for the first time, and then buy a cheaper front-tine tiller to maintain friable soil on an annual basis. Mid-Tine Tiller: These are a variation of front-tine tillers where the tines are directly under the engine. The weight of the engine helps push the tines into the earth, while widely-spaced wheels on either side provide added stability. Mid-tine tillers are used for the same purposes as front-tine models, but they require significantly less strength to operate. There are three main types of tines. Most tillers, especially the more expensive models, are designed to allow you change from one to the other depending on soil conditions. Sometimes it’s necessary to take a pass through the soil with each type, in succession. Bolo: These curved or L-shaped blades are what comes standard on most models. They are best suited when deep tilling is desired and where rocks, vegetation, and roots are minimal. Slasher: This is the best choice for cutting through roots and heavy vegetation. They are designed to prevent such debris from wrapping around the tines and becoming stuck, which is a common complaint with bolo tines. Pick and Chisel: These are used to break up hard, rocky ground. Some small cultivators are powered with an electrical cord, rather than a gas engine, eliminating much of the noise – and all of the exhaust. Some even operate with a rechargeable battery, the same as a power tool. There is virtually no maintenance involved in electric cultivators. Gas engines are smelly, dirty, and require regular maintenance, such as oil changes and spark plug replacement. You’ll also need to drain the gas in winter or add a fuel stabilizer to keep it fresh for use again in spring. Smaller, front-tine tillers employ two-cycle engines, which run on a mix of gasoline and engine oil, while all rear-tine and larger front-tine models have four-cycle engines that run on straight gas. The bigger the engine, the more expensive and complex the maintenance becomes. There are a variety of special features and add-ons that can make a tiller easier to use, and useful for a variety of tasks. Adjustable Tilling Depth: One of the most basic features, this is essentially an adjustable bar at the rear of the tiller that controls how deep the tines can reach. Adjustable Tine Width: Some models allow you to slide the tines closer together or farther apart for cultivating in rows of various widths. Collapsible Handle: Most common on front-tine tillers, this feature makes it easier to fit a tiller in the back of a car or in a small storage space. Counter-Rotating Tines: Some rear-tine tillers are designed so the tines spin in reverse as the wheels spin forward, creating additional traction and allowing you to till deeper, even in heavy soils. Dual-Rotating Tines: High-end rear-tine tillers can switch back and forth between forward and reverse tine rotation. Reverse Gear: This feature pertains not to the tines, but to the wheels of a rear-tine tiller. Being able to drive the machine in reverse makes it more maneuverable in tight spots and much less strenuous on the user. Electric Start: Gas tiller engines are typically started with a pullcord, just like a lawnmower. Models with this feature start with the push of a button, however. Attachments: Numerous gadgets are available to convert tillers to other uses, including snowblowers for winter maintenance and edgers and dethatchers for lawn maintenance. High-end rear-tine tillers typically include a PTO shaft, an all-purpose receptacle that can power a large number of implements, much like a tractor.